"Some say the massive holdings by China have implications for US national security, making it harder for Washington to carry out policies in conflict with Beijing". It is one of the reasons why the Dalai Lama has to leave the White House through the kitchen door. 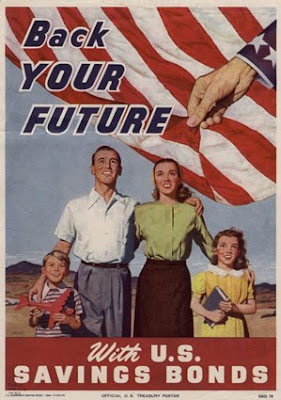 The Chinese are backing their future. The latest figures by the Treasury Department this month showed a drop in China's Treasury bond holdings by 34.2 billion US dollars or 4.3 percent to 755.4 billion US dollars in December, the biggest decline in about a decade. Simon Johnson, a former IMF chief economist, suggested that China could be behind the big jump in Britain's holdings of US debt to 300 billion US dollars in 2009 from 130.9 billion US dollars a year earlier. "A great deal of this increase may be due to China placing offshore US dollars in London-based banks -- Chinese, UK, or even US -- which then buy US securities," Johnson told a hearing of the US-China Economic and Security Review Commission, which monitors for Congress the security implications of US-China trade and economic relations. Johnson said "a reasonable working assumption" showed that China owns close to one trillion US dollars of US Treasury securities -- nearly half of the stock of treasuries in the hands of "foreign official" owners, which was 2.374 trillion US dollars at the end of 2009. China accumulated 453 billion US dollars in additional foreign exchange reserves in 2009, bringing the total reserves to a record 2.399 trillion US dollars at the end of December, latest Chinese government figures showed. After the last week 'historic' meeting between the Dalai Lama and President Obama, the White House spokesman Robert Gibb stated that the US President supported “the preservation of Tibet’s unique religious, cultural and linguistic identity”. The Communist leadership in Beijing will tell him: "Well, my friend, it is what we are doing". Everyday, the website of the China Tibet Information Center propagates the myth that China is preserving the culture of the Tibetan people. 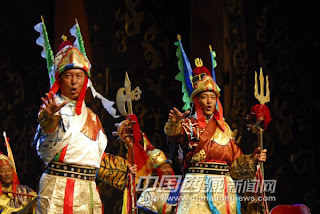 Tibetan drama is widely loved for centuries by Tibetan people with its strong romantic feature and legendary stories. With efforts from the central government and TAR local government on its protection and development, Tibetan drama blooms in modern society. I find this absolutely obscene. And this guy get the Nobel Prize for environment. And his TERI associate is part of the Government's team which advocates the 'per capita theory' for the CO2 emissions. 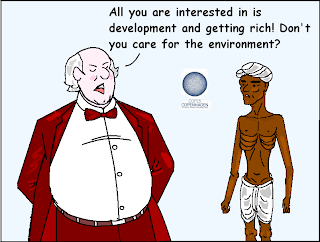 It is too easy to make it that it is 'poor' vs 'rich' like in the cartoon. Who is 'rich'? Who is 'poor'? One point is sure TERI is not poor. Ratan Tata should asked TERI to withdraw the name of 'Tata' from TERI. Their behaviour is such an insult to Jamshedji or JRD! The Energy Research Institute (TERI) is in the thick of another building storm. The R. K. Pachauri-led not-for-profit organisation's mission is to "work towards global sustainable development, creating innovative solutions for a better tomorrow". However, contrary to its public message, it runs a water guzzling nine-hole golf course in Gual Pahari in Gurgaon built on institutional land thus affecting the city's vulnerable groundwater table and to boot, charges Rs 25,000 as membership fee, something that is considered illegal on institutional land. Pachauri is also the head of the Intergovernmental Panel for Climate Change, a Nobel Prize-winning organisation that has faced flak from all quarters in the last three months due to dubious research being presented as part of its climate change report submitted to the United Nations. As the IPCC chief he has been asking governments around the world to cut down on carbon emissions and save water, among other things, to sustain the environment. In Gurgaon, though, TERI's is a completely different story. Here, it runs a five-acre golf course as part of the 69 acres of institutional land it acquired from Haryana Urban Development Authority (HUDA) in 1985 to build a residential training facility for executives called Retreat. Work on the golf course began in 2005. According to Gurgaon's district town planner Vijender Singh Rana, commercial activity through sports on institutional land is illegal. "HUDA gave this land to TERI for institutional or public and semipublic purpose," Rana said. "Though they have asked for change of land use (CLU) regularly from HUDA, permission cannot be given for any sporting activity. If TERI is selling golf course memberships, it is wrong." Rana said the conditions for use of institutional land were clear. "If TERI uses it for its own purpose, there is no problem. But it cannot use it commercially and sell golf memberships," he said. A TERI spokesperson denied it was making commercial use of the course. However, when MAIL TODAY anonymously contacted the course officials, they offered memberships for Rs 25,000. According to Rajiv Chhibber, manager, corporate communications, TERI, "The recreation facilities at the Retreat were created for TERI employees and visiting scientists, researchers and champions of sustainable development. "The greens have been laid on land in accordance with the zoning plan and around existing natural contours of land. In doing so, TERI has developed and maintained the green cover which has been a part of the overall environmental plan of the campus." But not everyone is satisfied. According to a Centre for Science and Environment official, maintaining a golf course puts tremendous pressure on the local environment. "The pesticides used to keep the grass green pollute the groundwater and affect nearby water bodies too," he said on condition of anonymity. "Golf courses use fresh water, which is a huge wastage when the groundwater level is already declining." Experts say an 18-hole golf course can consume up to 1.77 lakh cubic feet of water per day which equals 4.8 million litres. "This amount can sustain 20,000 Indian households," said Jyoti Sharma, president, FORCE, an NGO that works for water conservation. "Such golf courses extract groundwater and have bore wells near the ground. The grass soaks more water due to the pesticides used to maintain the ground's bounce." According to the WorldWatch Institute, a think tank that monitors global environmental trends, golf courses in the US alone consume 4 billion gallons of water every year (one gallon equals 3.785 litres) to maintain more than 1.7 million acres of golf greens. Although the TERI golf course is only a nine-hole one, there is seemingly tremendous demand for its membership. Mohinder Singh, an official at the course, told MAIL TODAY over the phone that the wait time at the club is of one year. "Your form will come for review after a year," he said. Singh was unaware that MAIL TODAY was investigating for a story as the call was made by this correspondent posing as a potential club member. According to the CSE official, "A lot of water is needed especially in Delhi and surrounding areas to maintain the right amount of moisture in a golf course. At the time when groundwater levels are declining for various reasons, the waste of water in golf courses can be avoided." For Gurgaon, the situation is exacerbated because the city is completely dependent on groundwater for survival. Hydrologist S.K. Sherawat said that though golf courses are not the only reason for the city's declining groundwater table, it is a contributor. TERI's Chhibber said the institute is taking great care that the environment is not adversely affected. "The Retreat is managed in a way where nature is continuously preserved," he said. "No chemical fertilisers or pesticides are used on the campus. Water conservation measures on the campus include an efficient central rainwater harvesting system in accordance with water conservation guidelines such as drip water irrigation, early morning and late evening half circle sprinkling to minimise water evaporation and loss. The water table at present is just 50 ft below the surface which is far higher than many areas in the NCR, where the groundwater levels range between 150 ft to 200 ft."
However, according to a recent report of the Central Ground Water Board (CGWB), the groundwater table of Gurgaon has crossed 40 m (120 ft), which it says is an alarming trend. The CGWB report said the long term water trend shows a rate of decline of 0.8 m/year. A review of my book, the Negotiations that never were appeared in the latest issue of The Organiser. 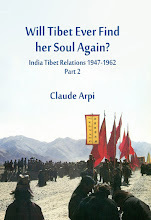 It is written by Madhuri Santanan Sondhi and entitled Beijing's obstinate stand on Tibet. Click here to read. My article Victory to the Gods, has been published in the Edit page of The Pioneer. Click here to read. Just to clarify that I am not the author of the article The legend of Baba Harbhajan: Revered ghost of Sikkim, I just wrote the comment on the current state of preparedness of the Army on the northern front. I found this interesting article on the net. A plate at the Harbhajan Singh's memorial (in Sikkim) details the life of the jawan/ghost. If due to technicalities in the procurement policy, Mr. A.K. Antony is not able to spend his alloted defence budget before March 31, he should think of posting more ghosts on the border.It is ideal as even the Chinese believe in it. Further, India can go the UN and truthfully speak about demilitarization, as ghosts are not accounted as conventional weapons. The only problem might be that China begins using reverse technology to produce its own ghosts in Tibet. 'Harbhajan Baba ki Jai', says the taxi driver as he crosses the rickety bridge over the Teesta River. 'Harbhajan Baba' is revered across Sikkim as a sacred entity. And this is his story. 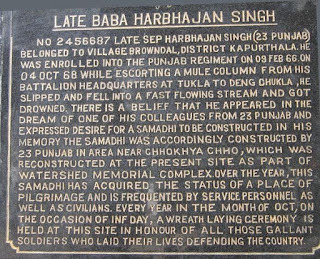 LATE SEPOY Harbhajan Singh was enrolled into the Punjab Regiment on Fbruary 9, 1966. Born in the village of Browndal in Kapurthala district of Punjab, he enlisted in the army at an early age and found himself posted on the misty heights of the Sino- Indian border near Nathula Pass. The year 1968 saw heavy rainfall and vicious floods in the region. On 4 October, 1968, while escorting a mule caravan from his battalion headquarters at Tukla to Deng Chukla, he fell into a fast- flowing stream and was washed away. The search for his body continued for a couple of days but was abandoned due to inclement weather. And one day, Harbhajan Singh appeared in the dream of one of the sepoys in his unit. In the dream, he informed his colleague that he was no longer alive and told him the exact spot where his body would be found. He asked him to construct a Samadhi at the spot where his body would be found. After saying that he will always patrol in the area and never give up being a soldier, he disappeared. The man woke up and dismissed the dream as a manifestation of his grief for Harbhajan Singh’s loss. It wasn’t until another member of the same unit had the same dream down to the last detail that suspicions were aroused. It seemed an incredible coincidence that two people could have dreamed the same sequence of events. When a search party was dispatched to the spot that had been described in the dream, late Sepoy Harbhajan Singh’s body was found. He was cremated with full military honours and a Samadhi was made at Chhokya Cho as per the wishes that he had expressed in his dream. The first part of the dream had been accurate and what about the second half about remaining a soldier forever? Soon reports of a man seen patrolling the area began filtering in. Soldiers deployed in the area would talk of a lone uniformed man on horse patrolling the region. Forces on the other side of the border confirmed these reports and claimed that they too had seen the ghost rider. Over the years, soldiers in the area began seeing Harbhajan Singh in their dreams where he instructed them of loopholes and unprotected areas from where the Chinese could attack. His instructions generally proved to be accurate and the legend of Baba Harbhajan Singh grew. Meanwhile, the popularity of the shrine was also growing. It gained significance as a religious spot and people came with the faith of having their problems solved or their infirmities cured by the Baba who had come back from the dead. The Samadhi dedicated to Harbhajan Singh consisted of a three room complex where a bed would be laid out for him and his uniform and boots would be displayed for the visitors. Caretakers of the Samadhi would swear that each morning the bed sheets would be crushed as if someone had slept in the bed the previous night and the carefully polished boots would be soiled and covered with mud. This conundrum only added to the Babas followers, who came in truckloads. The Indian army realised the importance of Late Sepoy Harbhajan Singh and in honour of his contribution, he was promoted to Honorary Captain. A pay check would be sent home to Kapurthala every month and more interestingly, he would go home on annual leave on September 14 every year. Soldiers would pack his trunk with basic essentials and ‘Capt Harbhajan’ would be accompanied by two soldiers all the way to Kapurthala by train and brought back after a month the same way. This tradition continued for years until he was retired a few years back. Following the twisting narrow roads at a steep incline, taxis and cars snake their way to 14000 ft to visit Harbhajan Baba every year. Devout believers from all over Sikkim and Bengal visit the Samadhi bringing the sick and the elderly in the hope of a miracle. They bring bottles of water and take back those lying there. It is believed that water left at the Samadhi over a period of time turns to holy water and is capable of curing ailments. Food is served to the devotees who make the arduous journey by the soldiers looking after the Samadhi. The Samadhi dedicated to Harbhajan Baba is located amidst a beautiful panorama of high mountains broken in places by gushing waterfalls and dotted by multi-coloured shrubs. En route, one crosses beautiful lakes and hamlets that resemble something out of a picture postcard. One such village is Kyangnosla. The ascent is steep and often takes skilled driving. In order to reach the Samadhi, a detour must be taken along the road that leads to the Sino- Indian border post of Nathula which was opened for trade recently. The Samadhi attracts people from all religions – In its own way, it has promoted a certain secular equanimity in the region – a rare feat in today’s world. Taxi drivers and soldiers passing through the area generally stop at the Samadhi to pay obeisance to the revered Baba. Not doing so is supposed to bring bad luck. In a society that is dictated by tradition and supported on the pillars of superstition, it is not uncommon to find a legend of this kind. Perhaps the Chinese are just as superstitious as we are because at the monthly flag meetings between the two nations at Nathula, the Chinese set a chair aside for Harbhajan Baba. And as the red flag bespeckled with stars flaps in the icy wind next to the tricolour, a lone figure perhaps stands and watches- ever alert, ever watchful, ever zealous, and ever protective of his country’s honour. A zeal that has lasted beyond death. Perhaps Internet will pave the way to China's freedom, but certainly not Google who have always collaborated with Beijing to censor the Net. Their latest 'decision' to quit China, is probably just a marketing gimmick.They have been evil for too long, they need to refurbish their image. The present regime will never give on its own a 'meaningful autonomy' (which includes removal of censorship) to Tibet, the same offer would have to be made to the rest of China. Ultimately, it would mean the demise of the Chinese Communist Party. Only a revolution will bring about this change. The Dalai Lama, the exiled spiritual leader of Tibet, said the United States and other countries could help his campaign for a free Tibet by promoting an open society in China. "Censorship ... is the source of the problem," the Dalai Lama said Saturday in Beverly Hills. The Dalai Lama fled Tibet in 1959 after a failed uprising against Chinese rule. He now lives in exile in India and advocates "meaningful autonomy" for Tibet within China. "The Chinese people have no opportunity to know our issue," said the Buddhist monk, who Beijing has branded as a dangerous separatist for demanding Tibetan self-determination. "Once China becomes an open society -- freedom of speech, freedom of press, freedom of information -- all this unnecessary fear and doubt will reduce," he said. "That's the real answer for this problem. "Americans can help in this change," he said, adding the lack of free information has helped the Chinese government portray him as a demon and a terrorist. "Do I look like a demon?" the winner of the 1989 Nobel Peace Prize joked, holding his fingers beside his head to make horns. The Dalai Lama, who was to speak on behalf of Whole Child International, an organization that works for orphans around the world, said Western search engines like Google were important such as the free flow of information within China. He noted they had ceded to pressure from the Communist government there to limit what users can see. 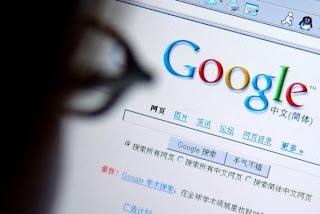 Google last month threatened to pull out of China if the government did not agree to stop censoring its Chineselanguage service. The Dalai Lama's visit to Los Angeles came on the heels of his low-key meeting Thursday with U.S. President Barack Obama, which upset Beijing. Obama used his first presidential meeting with the Dalai Lama to press China to preserve Tibetan identity and respect human rights in the region, which has been under Chinese rule since 1950. The Dalai Lama was reluctant to predict what impact the meeting would have. If this is confirmed, it is very bad news. Was it not better not to meet the Nobel laureate 2009 than this exit through the back door? On the picture, the Dalai Lama does not seem bothered at all. 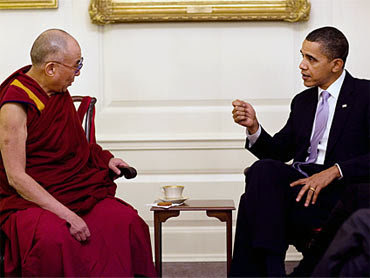 Obama would not meet the Dalai Lama in the Oval Office. Obama showed the Dalai Lama the back door today after their meeting. 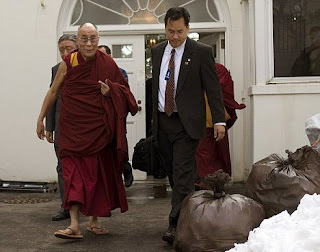 The Tibetan spiritual leader, who was also denied a meeting in the Oval office, left via a side entrance where rubbish bags were piled up and The White House didn’t release photos of the meeting until several hours afterwards. My interview with George Fernandes has been published by Sify.com. To read click here. is posted on Rediff.com. Read it. I find this very touching because these people are ready to risk their life to show their devotion to their leader (and to the person that they perceive as the leader of the world). 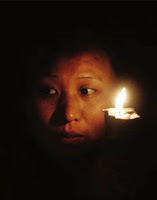 Bangalore, February 18 – Thousands of Tibetans took to the streets of Ngaba County today, not in protest but in joy, hours before the much talked about meeting between His Holiness the Dalai Lama and US President Barack Obama. The mournful atmosphere of the Tibetan New Year was replaced by jubilation with people cracking firecrackers in the streets and celebrating. 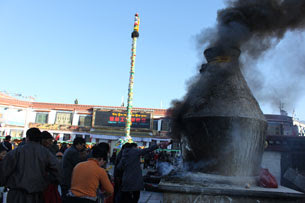 Tsering, a monk of Kirti monastery in Dharamsala, told phayul that his contacts in Ngaba had seen thousands of Tibetans from nearby villages and townships gather near Ngaba Kirti monastery campus and burn incense in the gigantic incense burner and throw wind-horse prayer flags in the air. 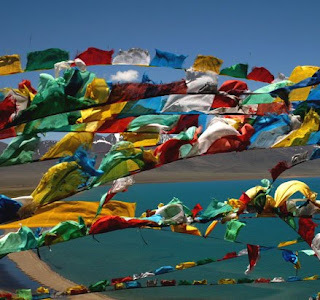 People wandered in the streets and shouted ki ki so so lha gyalo (victory to gods - a slogan Tibetans say after throwing tsampa in the air during the incense burning ritual of purification, tib: Sangsol or lhasol), he said. Amid the chaos, Chinese security forces were alert ensuring that the Tibetans did not take the opportunity of large gathering to hold anti-government protests, Tsering added. Sources have also said that some Chinese police even confiscated firecrackers from Tibetans and extinguished already lit firecrackers. The Tibetans in Tibet have great hope that the meeting between Obama and His Holiness will bring some positive development to Tibet issue, said Tsering. At the time of this report going online many monks of Ngaba Kirti monastery were still sitting around the incense burner saying prayers, according to our source. Celebrations were said to have taken place in several places in Tibet but no reports have come out as yet. China is today so powerful that not doing what its leadership wants (or dictates) is a 'defy', even when it comes from the lone superpower of the planet? One thing is sure, the meeting was good for President Obama's image at a time his popularity is tumbling fast (mainly due to domestic policies and his position in Afghanistan). As for the Dalai Lama and the Tibetans, I am not sure, though, I am pretty certain that it will not change anything. The Chinese leaders are today too arrogant to listen to anything coming from Washington. In fact, they resent any advice from the West. And let us not forget, the United States are an indebted country.What can a nation with such a huge debt towards China impose on the Middle Kingdom? Nothing! The Tibetan issue is more complex (even for China) than some Western analysts make it to be and the present leadership in Beijing does not have the courage or the charisma to take the plunge and offer a 'genuine' solution to the Tibetan leader. It is pity because he is perhaps the only person who could help sort out the contradictions of today's China. But we should also acknowledge that a 'genuine' solution would bring about tremendous changes inside China and perhaps the collapse of the present system under a Party unique. In any case, there is one lesson for Obama and other Western leaders: the loud noises coming from the mouth of the spokesperson of the Chinese Ministry of Foreign Affairs is more for the show (though it often works), bilateral relations will continue as usual. The Chinese leaders will keep fighting for what they perceives as their 'national interests'. Meeting or not meeting does not change the fundamental position of Beijing which has remained the same for the past thirty years.It is what I have shown in my book on the 'negotiations that never were'. For his good conscience (and the good conscience of the people of the United States), Obama will probably grant of few millions dollars to the 'most successful refugees of the world', but they will remain refugees. Ignoring strong objections by China, United States President Barack Obama on Thursday met exiled Tibetan spiritual leader Dalai Lama, who is set to seek his help in resolving the vexed Tibet issue. The two Nobel Peace Prize laureates met away from the cameras in the White House Map Room, in what is being billed as a low-key meeting, which the US administration calls private. But an angry China has warned that the meeting could worsen relations between the two powerful countries. The Map Room in the mansion is the place where presidents stage private meeting. The parleys with the Dalai Lama are not taking place at the more stately Oval Office where Obama frequently meets with world leaders. Terming it as an important meeting, Dalai Lama's Special Envoy Lodi Gyari said the 74-year-old Buddhist monk will speak about Tibet, and the two are also likely to discuss global concerns. 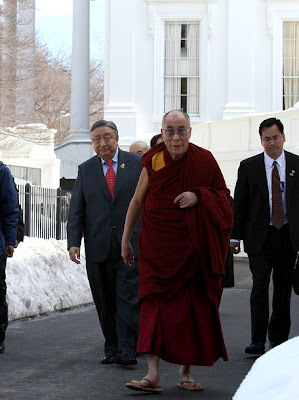 "His Holiness will be asking the President to help find a solution in resolving the Tibet issue that would be mutually beneficial to the Tibetan and Chinese people," Gyari said in a statement issued soon after the arrival of the Dalai Lama in Washington on Wednesday. The visit comes despite stiff opposition from China, which urged the Obama administration to cancel the meeting, warning that it would damage Sino-US ties. Analysts said the meeting will be muted because a public appearance by Dalai Lama and Obama would enrage China, which believes that official foreign contact with the monk infringes on its sovereignty over Tibet. "China resolutely opposes the visit by the Dalai Lama to the United States, and resolutely opposes US leaders having contact with the Dalai Lama," according to foreign ministry spokesman Ma Zhaoxu. My article on Cyberwar and the 'destruction of rules' is posted on Sify.com. Click here to read. Also shameful is the fact that Herve Morin, the French Defence Minister says that he has no knowledge of the report. In 2001, a Parliamentary Committee published a detailed report of the 'tests' (in French). It was mentioned that 42 Army personnel had received 'skin contamination'. In India on such occasion, the Opposition would have asked the Minister to resign and he would have refused. At the end, the result is the same: irresponsible politicians can get away with any utterance; they will probably say that they were misquoted. A small mercy, the test was a total failure: instead of the planned output of 10-16 kilotons, only 1 kiloton was produced. French authorities deliberately exposed soldiers to nuclear testing in the Sahara, according to researchers citing a confidential French military report. At least one test aimed to "study the physiological and psychological effects of nuclear arms on man", they say. Le Parisien newspaper, which carried excerpts from the document on Tuesday, quoted the defence minister as saying he had no knowledge of the report. Some soldiers say they were made ill by French tests dating back to the 1960s. They have complained for decades that they were given insufficient protection from radioactive fallout during testing, with some claiming they were used as "guinea pigs". After long denying any responsibility, the French government drew up a bill last year to compensate veterans for health problems that could be linked to the tests. Researchers at the Armaments Observatory in Lyon, a non-governmental research group that has worked closely with French veterans of the nuclear tests, said the report they cited was written in the late 1990s as an overview of French testing, and drew on secret military documents. It describes official interest in studying "the physiological and psychological effects of nuclear arms on man" in connection with France's fourth atmospheric test, Gerboise Verte, on 25 April 1961. It says "foot soldiers" were deployed in "tactical exercises" during the test, in an attempt to measure the possibility of mounting a military operation in the aftermath of a nuclear attack. The men were made to approach to within a few hundred metres of the blast site shortly after the explosion. Patrice Bouveret, a researcher at the Armaments Observatory, said the report was the most explicit indication so far that French authorities had knowingly exposed test participants to dangerous side effects. "Up till now we had never had direct account of 'foot soldiers' being used in these manoeuvres," he told the BBC. "[The French authorities] knew that they were putting them in danger when they sent them on these manoeuvres and at the very least they should have taken measures to protect their health." Defence Minister Herve Morin was quoted by Le Parisien as saying he had no knowledge of the report, while stressing that the level of radiation to which participants were exposed was "very weak". The French parliament approved the government's bill to compensate veterans last month. But veterans have complained that its provisions are too restrictive and that only a fraction of those affected will be eligible for compensation. They are lobbying for the law to include more tests, a broader geographic area, and a greater number of illnesses, when it comes into force later this year. They also want provisions for environmental clean-ups. 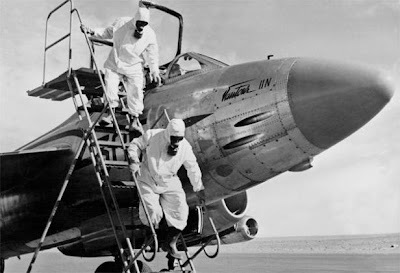 The French carried out 17 nuclear tests in the Algerian Sahara in the 1960s. France later switched testing to French Polynesia, where a further 193 tests were completed before it ended the practice in 1996. George Fernandes has always been a courageous man. I interviewed him a few years ago. Already he was not too well, but he stood by the conviction of his youth. He recounted his association with Dr Ram Manohar Lohia and the Dalai Lama. I am very sadden but what is happening to him. Friends of Rajya Sabha member and senior Janata Dal-United leader George Fernandes [ Images ] on Tuesday made an appeal, endorsed by many eminent personalities like Union ministers Farooq Abdullah [ Images ], Jaswant Singh [ Images ], business tycoon Rahul Bajaj [ Images ], and eminent dancers Leela Samson and Dr Sonal Mansingh among others. George Fernandes is one of the most influential of India's [ Images ] political leaders of the last four decades. His entire life was dedicated to fight tyranny, oppression, corruption, and for the upliftment of deprived sections of our society. His battles for equality, democracy, a free media, human rights, and against all forms of injustice are well known. 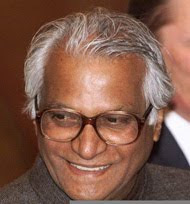 We, the long time friends of George Fernandes, are deeply distressed at the events of the last few weeks, which diminish this image of a great man who, due to a debilitating illness, is unable to defend himself or express himself publicly. We are also making this public statement to convey our deep concern for the wellbeing, health and care of our friend George. We understand he is being moved from place to place and decisions on his well-being are being suddenly and arbitrarily taken by people who are not familiar with the particular aspects, past progress and treatment of his ailments. This is bound to have a severe adverse impact on his state of mind and body. A panel of suitable people comprising of his familiar doctors at AIIMS (All India Institute of Medical Sciences) and his long-time colleagues and care-givers, including the immediate and extended family, should be constituted through a legal process to ensure a stable atmosphere for him to feel comfortable and at ease. All unseemly speculation and discussion being carried out in public view about his assets and relationships undermine the values that our friend George stands for. It is our duty as his friends and admirers to ensure him his dignity and to demand respect for what he has done and the choices he has made over so many years. 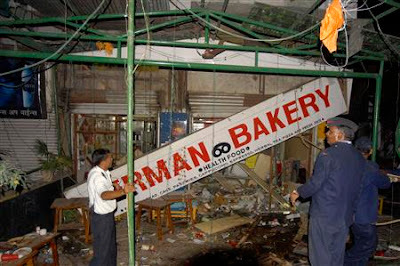 A couple of hours after after I read this interesting article published in the Indian Defence Review, terrorists bombed the German Bakery in Pune. It seems obvious that India did not suffer any terrorist attack for the past one year, just because Delhi refused to talk to Islamabad as long as the perpetrators of 26/11 were not punished. This decision put a tremendous pressure on Islamabad to deal with the rogue elements in Pakistan. But the Indian government changed its policy (probably for the sake of pleasing Obama Administration); the pressure on Islamabad was removed and a few days later, terrorism stroke again in India. Indian leaders and politicians should think carefully before taking the next step. A leading Indian English language newspaper has chosen to begin 2010 by stirring up controversy. It has run a series of editorials advocating peace initiatives with Pakistan, despite the manifest unwillingness of Islamabad to punish the perpetrators of 26/11. What might have begun as a practical joke by the newspaper’s editorial staff has since acquired pretensions to seriousness. The newspaper cites a dubious and unverifiable poll result, suggesting that most people in India and Pakistan strongly desire a resumption of peace talks between the two countries. Going by the reader response posted on the newspaper’s website, the poll was either poorly conducted or biased in its sampling. A very large number of Indians are in no hurry to forget Pakistani sponsorship of terrorism. 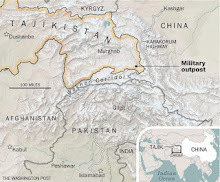 Their reluctance to let bygones be bygones stems not from hostility towards Pakistan per se but rather, a natural instinct towards self-preservation... Read on. I am wondering why the Tibetans are so keen to find a solution within the framework of the People's Republic of China. Today China is not even ready to allow them to eat tsampa (barley flour) on their New Year. Where is the question of autonomy? Mundgod, Karnataka, February 15 – A sit in protest by around 400 Tibetans on the first day of the Tibetan New Year led to a standoff between the Tibetan protesters and Chinese security forces in Ngaba County. The Tibetans sat at the main market square and ate dry Tsampa and breads in a symbolic expression of a mournful New Year, according to the Emergency Coordination Committee of the Kirti Monastery in exile. The monks and laypeople said prayers and threw Tsampa in the air to mourn the killings of several Tibetans in the 2008 protests all over Tibet. 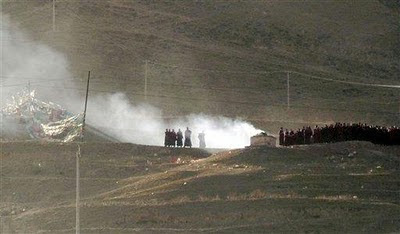 The monks sitting at the protest are from Ngaba Kirti Monastery and Sey Monastery. As tension escalated, Duedul Trulku of Kirti monastery’s religious affairs body arrived at the protest site and urged everyone to return home to avoid any untoward incidents but his requests fell on deaf ears. Later, they asked the monks of Kirti monastery to return to their quarters but monks of other monasteries and laypeople joined the protests. The Chinese soldiers confiscated mobile phones of people who took video and pictures of the protest. Tension has been looming large on Ngaba County since the 29th day of the closing year that saw a large gathering of Tibetans at a special religious dance amid tight security. At the time of this report going online the army had blockaded the routes to the square to prevent Tibetans from outside to join the protests. 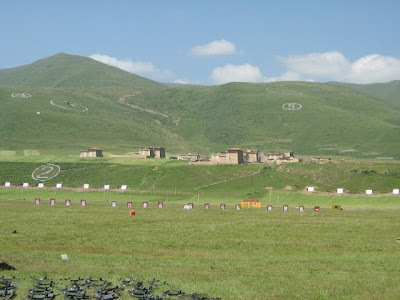 “The Tibetans in Ngaba are showing the Chinese government that they are not celebrating the New Year the way the government wants but observing it to mark their respects to the Tibetan martyrs who laid down their lives,” said Tenzin Choeying, the president of the India chapter of the Students for a Free Tibet. My article on The Year of the Iron Tiger has been published in The New Indian Express. Read it. Wishing everybody a Very Happy Losar (Tibetan New Year). Let us pray that the Iron-Tiger Year will be a peaceful and great year for the people of Tibet, India, China and ... for the World. A 14-page ‘restricted’ report prepared by the British intelligence agency MI5’s Centre for the Protection of National Infrastructure has recently come to light. The report describes how China has attacked UK defence, energy, communications and manufacturing companies in a concerted hacking crusade. It also details how undercover intelligence officers from the People’s Liberation Army (PLA) and the Ministry of Public Security approached UK businessmen at trade fairs and exhibitions, offering them ‘lavish hospitality and presenting nice ‘gifts’. Unfortunately for the recipients of the famed Chinese hospitality, the gifted cameras and memory sticks, tokens of Chinese friendship contained electronic Trojan bugs which could enable hackers to remotely access business men’s computers. According to the MI5 report, the Chinese government “represents one of the most significant espionage threats to the UK”. China was also accused of ‘bugging and burgling’ UK business executives and setting up ‘honeytraps to later blackmail them'. Today more widespread than these ‘honeytraps’ are the cyber attacks by Chinese hackers. The public became aware of this new type of warfare after Google announced that it would reconsider working in China: the US search engine giant had been the victim of wild attacks originating from China. The attacks involved did not only Google, but more than 30 companies whose servers were intruded by hackers; this included several human rights groups and some prominent Chinese dissidents. What provoked Google to react in such a sudden manner was the high sophistication of the attack. The attackers seemed to have employed some techniques never seen before. They believe that the Google attacks were unusual not only in ‘scope or sophistication’, but also ‘in terms of the high-profile nature of the victims’. According to these cyber watchers, “targeted cyber attacks such as these will grow in frequency as cyberspace becomes more heavily contested. …solutions won’t be easy". This is the general opinion amongst experts. They cite for example criminal organizations “thriving in the hidden ecosystems of cyberspace, profiting from cyberattacks, cybercrime, and cyberfraud”. Hardly a month later, The Tribune reported that “computer networks at sensitive establishments have experienced a second wave of cyber attacks from foreign-based hackers. Sources in the intelligence reveal that fresh attacks began on January 28 and about 25 computers were targeted.” The attacked computers belonged to the National Security Council (NSC) Secretariat and the National Security Advisory Board (NSAB). The source of information was an official at the National Technical Research Organisation (NTRO) which is supposed to deal with cyber attacks. Again the Chinese ‘signature’ was suspected. The NTRO has apparently formed a rapid reaction team to deal with such attacks. They claim that their reaction time is about an hour-and-a-half. Experts consulted, however, dismiss this as pure wishful thinking, as attacks are now very sophisticated and not easy to notice. But let us go back some years. In February 1999, the PLA Literature and Arts Publishing House in Beijing released a fascinating book written by Qiao Liang and Wang Xiangsui, two Senior Colonels of the People’s Liberation Army. The title of the book was Unrestricted Warfare. One of the reasons behind this thinking has been the arm-dealers lobby striving to sell military ‘hardware’. But the Art of War is changing fast, very fast. As the Defexpo India 2010 is opening at the Delhi Pragati Maidan, many believe that the exhibitors are only ‘Showcasing Land and Naval Systems’ of yesterday. The War of Tomorrow is being prepared behind some computer monitors in Sichuan or Hainan. The recent shutting down of the Black Hawk Safety Net, the largest hacker training center in Hubei Province is only an eye-wash, smaller centers working in close collaboration with the People's Liberation Army will remain opened and hacking will continue as before. 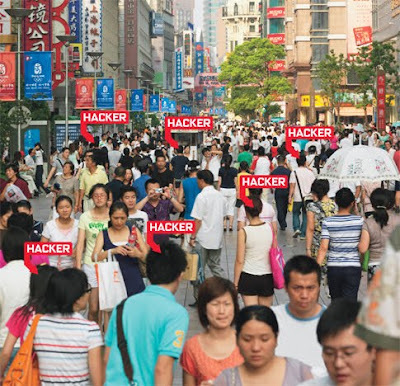 The Chinese State is clearly identified in these attacks. It will probably take 10 years for the NTRO to prepare such a report and 10 more to make it public. Here, as in infrastructure development, India is far, far behind China. While it will take several more years to complete a deal for 126 Multi Role Combat Aircrafts (for some 11 billion dollars), for a much smaller budget, the Chinese will have found ways to neutralize the electronics of these planes. But there is worse. In a forthcoming novel, Directive 51, John Barne envisages the collapse of the world ‘financial life’ (most of our ‘assets’ being kept inside some banks’ computer systems), the halt of most manufacturing systems, the evaporation of the technical knowledge and legions of other consequences. Frightening! Let us hope that the Indian Government will wake up to the threat and NRTO will truly be able to respond in one hour. This is becoming more and more frequent. One of the problems is that it seems that there is no collaboration between agencies dealing with the issue. India has no choice but to invest more resources in this war of the future. Computer networks at sensitive establishments have experienced a second wave of cyber attacks from foreign-based hackers. Sources in the intelligence reveal that fresh attacks began on January 28 and about 25 computers were targeted. Computers used by individuals associated with the National Security Council (NSC) Secretariat and the National Security Advisory Board (NSAB) were the target of the new attacks, according to sources at the National Technical Research Organisation (NTRO). While NSC is the apex agency looking into the political, economic, energy and strategic security concerns, the NSAB consists of persons of eminence outside the government, with expertise in security matters, foreign affairs, armed forces, internal security, science and economics. Earlier attacks were experienced on January 15, when hackers hit computers being used by top government functionaries. 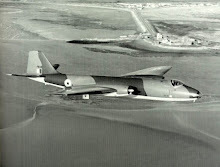 This included the Prime Minister’s Office, intelligence agencies and the armed forces. In fact, the Cabinet Secretary, who is also reported to be a victim of these attacks, had scheduled a hi-level meeting of security and cyber war experts this week to work out modalities to deal with such incidents. Sources at NTRO, a relatively new highly specialised intelligence gathering agency concerned with satellite, terrestrial and internet monitoring as well as cyber warfare, have pegged the number of computers to have been hit in these attacks at 450. Initial investigations revealed that 30 computers, including eight from the PMO, were compromised. This also involved two persons not on the regular posted strength of the PMO, prompting intelligence agencies to believe that the cyber attacks were backed by a high level of human intelligence, providing the whereabouts of key individuals and their portfolios and e-mail addresses. 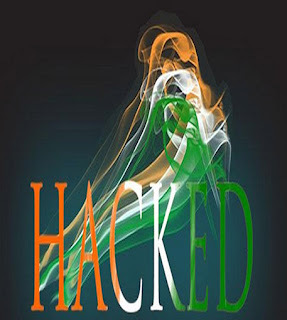 Others who came under attack from cyber space included chairman of the Joint Intelligence Committee, chief of the Naval Staff, deputy chief of Naval Staff, PM’s special envoy, the three military intelligence services and establishments of the BSF and CRPF in Jammu and Kashmir. Monitoring the flow of information from these computers led to the identity of other computers that were compromised. Experts feel that the number could be more if the net was cast wider. NTRO claims that the e-mail IPs of a couple of top mediapersons were also the target of these attacks. A MS-Word file titled National Security Document, containing a complex spyware was sent to the targeted addresses, which resulted in the computers being compromised once the document was downloaded. Earlier a malicious PDF file was also circulated. An e-mail address with a.nic.in suffix, said to be a dormant address hacked by the attackers, was reportedly used to send the mails. Sources said that cyber experts at NTRO used “reverse hacking” methodology to trace the origins of the servers used in the malicious attacks. It is strongly believed that the servers were traced to mainland China, the exact physical location could not be established due to the complex nature of the attacks. “Our technical corroborations and results from other similar investigations reveal that the command and control architecture of these attacks have a Chinese signature,” a source claimed. Under its Informationalisation Doctrine, China lays a huge emphasis on cyber war and it has a well set-up infrastructure for the same. Chinese believe cyber war to be the first element of surprise in a conventional war, to be used to cripple enemy civilian and military networks before going in for a physical offensive. Some time ago NTRO had formed a rapid reaction team to deal with such exigencies and sources claim that their reaction time to the attacks was about an hour-and-a-half. NTRO is also known to have developed an offensive cyber warfare capability designed to penetrate computer networks and remote servers. Indian Environment Minister Jairam Ramesh is wiser than his Chinese counterpart. He has declared a moratorium on Bt Brinjal cultivation. 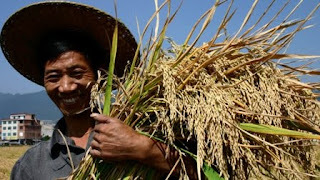 How long will the Chinese farmer smile (for the propaganda photo)? But given the controversy over the safety of GM food for a long time, such crops are not accepted in most countries, said Fang Lifeng, spokesman for Greenpeace China's GM program. A 2007 survey by the organization found that 65 percent of the 2,000 polled in the country said they would not choose GM food for safety reasons. We firmly oppose the technology being put into mass production and commercialization in a rush," Fang said. "To ensure food supply, we have other options with no potential health risks like biological agriculture," he noted. GM corn sold by Monsanto, the US-based agriculture company, causes organ damage in rats, mostly in the liver and kidney, according to a paper by three French scientists published in the International Journal of Biological Sciences. These substances have never before been an integral part of human or animal diet and therefore their health consequences for consumers, especially over the long term, are currently unknown, the paper said. Monsanto, in response, denounced the study on its website, asserting that "these claims are based on faulty analytical methods and reasoning and do not call into question the safety findings for GM products." An article written more than a year ago for the Indian Defence Review is now posted on the IDR website. Click here to read. Considering that the main issue in the dispute between Google and the Chinese regime is the 'cultural imperialism' supposedly imposed by the US firm on the Chinese people and considering that President Hu announced that Tibet should “go down the road of development with Chinese characteristics and Tibetan flavor”, I was surprised to see on a Chinese/Tibetan website the pictures of a 'Tibetan' fashion show organized for Losar (Tibetan New Year). Where is the Tibetan flavor? The website says: "Twenty models from Beijing perform fashion show titled 'Image of Tibet' in rehearsal of the Tibetan New Year Gala, which will be held on Feb. 14, 2010. The 'chief director' of the gala proudly declared: "I hope to display the soul of Tibetan ethnic costumes by integrating international stylish elements." 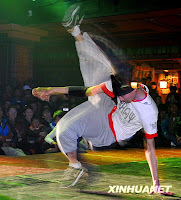 Another news item showed 'Tibetan' dance in Lhasa. Tibetan 'flavor' again! The region’s GDP is set to grow by 12 percent this year, while fixed-assets investments are expected to grow by a whopping 18 percent. 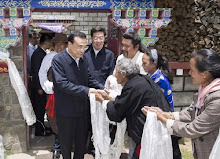 Under President Hu’s dictum of “going down the road of development with Chinese characteristics and Tibetan flavor” (zhongguo tese, xizang tedian), additional input has been focused on areas including infrastructure, tourism, mining and manufacturing. Little wonder that the share prices of a dozen-odd Tibet-related construction, transport and mining companies listed on the Shanghai Stock Market jumped sharply at the beginning of the year (Tibet Daily, January 9; Xinhua News Agency, January 9; People’s Daily, January 10). Shutting down hacker training centers? Though the largest hacker training center was closed, smaller ones working in close collaboration with the People's Liberation Army will remain opened. Being too visible, the Hubei center could not serve the interests of the Party and the PLA. Three people were also arrested, local media reported yesterday. The three, who ran Black Hawk Safety Net, are suspected of offering others online attacking programs and software, a crime recently added to the Criminal Law. A total of 1.7 million yuan ($249,000) in assets were also frozen. Police said more than 50 officers had been investigating the case. They seized nine Web servers, five computers and one car, and shut down all the sites involved in the case, according to the provincial public security department. "It is not very difficult to do simple hacker tasks. Some hacker members are teenagers who dropped out of school and make money by stealing accounts," he said. 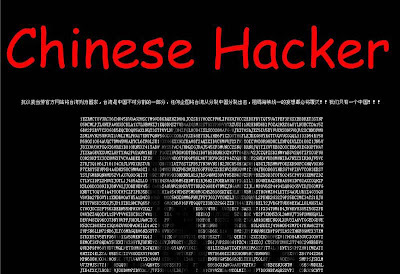 A 20-year-old college student who registered with three different hacker training sites said a hacker training course costs from 100 to 2,000 yuan. A year back, Beijing was furious with President Sarkozy who had dared to meet the Dalai Lama (not even in France) against their approval. The spokesperson thundered, threatened, some Carrefour supermarkets were even attacked, today China's Foreign Minister Yang Jiechi proudly announced “we are delighted that the French leader [Sarkozy] would visit [China] in April or May …it is a new page in Sino-French relations”. PARIS, Feb. 4 (Xinhua) -- French President Nicolas Sarkozy met visiting Chinese Foreign Minister Yang Jiechi at Elysee Palace Thursday on bilateral ties. Bringing New Year's greetings on behalf of Chinese President Hu Jintao to Sarkozy, Yang recalled recent sound developments in the bilateral relationship. He noted that there have been two successful meetings between Presidents Hu and Sarkozy in London and New York since last year. During the meetings, the two leaders reached important consensus, providing guidance for the direction of bilateral ties. The later visits of French National Assembly Speaker Bernard Accoyer and Prime Minister Francois Fillon were fruitful, which vigorously enhanced mutual political trust and pragmatic cooperation in various areas, Yang said, adding that the momentum for China-France ties has been accelerated. The Chinese minister noted that France was an influential country in the world, and China always attaches great importance to its ties with France. China is willing to work with France to intensify high-level visits, deepen mutual political trust, adhere to the principles of mutual respect, equality and mutual benefit, take care of each other's major concerns, and expand pragmatic cooperation in economy and trade, Yang said. He said China is also willing to increase negotiation and coordination with France on major international and regional issues, and enhance the strategic significance of the bilateral ties, so as to promote progress of the China-France relationship. 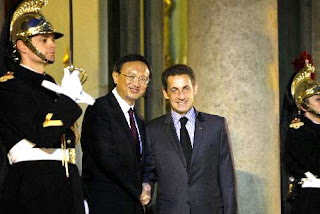 Welcoming Yang's visit and asking him to bring greetings to President Hu, Sarkozy noted the current state of France-China relations is sound. He said France always attaches great importance to relations with China, and highly appreciates the progress China has achieved and the role China has played in international affairs, hoping to further enhance bilateral cooperation in climate change and international finance. The president reaffirmed France's firm adherence to the one-China policy. Sarkozy said he is looking forward to attending the Shanghai World Expo, and he believes this event would be as splendid and impressive as the 2008 Olympic Games in Beijing. Previously, Yang met with his French counterpart Bernard Kouchner on Wednesday during his two-day visit to France, which is the third leg of his five-nation tour. He has already visited Britain and Turkey, and will attend a security policy conference in Munich, Germany, from Feb. 5-7. Nearly 8 lakhs of visitors for the Potala alone. It is good business for China. One understands that they were upset after the unrest in March/April 2008. It was a big loss in revenue. Last year, the Potala Palace received 782,500 tourists and worshipers, with a yearly increase of 62%, according to a cultural conference held in Lhasa. The Zhol City of the Potala Palace has embraced 28,000 visitors since its opening to the public last August and the Norbu Lingka also got 470,008 tourists and believers, up by 72.4%, said Yu Dawa, director of Tibet Regional Cultural Relics Bureau. The tourism industry resumed rapidly in 2009. Materials from Tibet Regional Cultural Relics Bureau said, till last October, the cultural units in Tibet have received over four million visitors, a new record in history. Since 1999, the reception of cultural units in Tibet is less than one million, and stands at one million in 2000 while exceeds one million in 2001 for the first time. In recent decades, the Central Government invested over 200 million yuan for two maintenances and the latter one started in 2009. Since 2003, Tibet has set a number-limit of 2,300 for daily visitors to the Potala Palace. 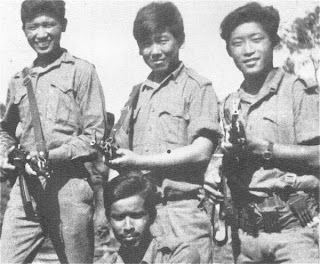 What about the Tibetan boys who died during the Bangladesh Operations? Today, it is convenient (for everybody) to forget about their existence. A few years ago, I wrote an article on the Phantoms of Chittagong. 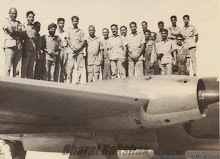 It was the name given to them by their Commander, Maj. Gen. S.S. Uban. the heart of the capital. Bangladesh will seek a list of martyred Indian soldiers in the 1971 Liberation War against Pakistan in a bid to honour them by inscribing their names at a memorial at Suhrawardy Udyan park, Tajul Islam, the State Minister of Liberation War Affairs, said on Tuesday. Kumar Singh, the next chief of the Indian Army, called on Islam at his office. Lt-Gen Singh, currently Eastern Army Command chief at Kolkata, will take over as the next Army chief from General Deepak Kapoor on March 31. Bangladesh won its independence after nine months of bloody struggle with the Pakistani military with crucial Indian support. It is said that "The completion of a sentry post reportedly located in Medog County of the Nyingtri Prefecture in the Tibet Autonomous Region (TAR)—bordering the disputed Arunachal Pradesh region—late last year apparently marked the completion of a nationwide surveillance system that serves as a component of this colossal infrastructure project." Methok (or Medog for the Chinese) is very close to the Great Bend of the Yarlung Tsangpo (Brahmaputra). It is where the Chinese are rumored to plan a dam to divert the waters of the Brahmaputra. It used to be one of the most remote areas of the planet. Today, it is linked to the rest of the Roof of the World by beautiful roads and an airport (in Nyingtri). Compared to India, China is definitively far in advance when it comes to infrastructure development of the borders areas. I am not commenting here on the 'digital' Great Wall, but only on 'material' developement. From January 29 to January 31, the National Committee on Border and Coastal Defense of the People's Republic of China (PRC) held its fourth meeting in Beijing. The meeting was attended by the top echelons in the Chinese Communist Party (CCP) and the People's Liberation Army (PLA). The Committee is under the directive of the Chinese State Council and Central Military Commission (CMC) and was previously convened in 1994 under former President Jiang Zemin. Charged with the coordination of China's vast border and coastal defense with different military regions, border or coastal provinces, and border police authorities assigned to protect China's homeland security, the Committee's monumental task is of particular importance to the Chinese leadership. Revelations from the meeting about the completion of a massive infrastructure project, which includes roads, tunnels, fences, and coastal defense installations among other units that began in 1994 reflects the coming of age of China's defense infrastructure, which not only serves military but also civil-economic purposes (Xinhua News Agency, February 1). According to reports from the official Xinhua News Agency, in 1994 Chinese leaders committed more than 4.7 billion renminbi to start a massive border and coastal defense infrastructure development project that was set in motion at the Committee's third meeting held the same year. In 2005, the title of the National Border Defense Committee was changed to the National Border and Coastal Defense Committee to accelerate the development of border and coastal defense by placing both areas under a unified command. Each military region, coastal province, prefecture and county was required to establish a border and coastal defense committee (Xinhua News Agency, January 28, January 29, February 1, February 2). Since then the PLA has reportedly constructed 25,000 kilometers of maritime border patrol tunnels, 7,000 kilometers of fences, and at least 3,000 border demarcations, watchtowers, coastal defense installations, harbors and tarmac as part of this national project. 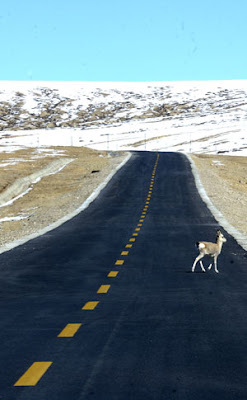 The completion of a sentry post reportedly located in Medog County of the Nyingtri Prefecture in the Tibet Autonomous Region (TAR)—bordering the disputed Arunachal Pradesh region—late last year apparently marked the completion of a nationwide surveillance system that serves as a component of this colossal infrastructure project. The Chinese media dubbed this network "China's Digital Great Wall" (Xinhua News Agency, February 2). According to a report in the South China Morning Post (Nanhua Zaobao)—a Hong Kong-based newspaper—the completion of the "digital surveillance system" (shuzi jiankong xitong) was an integral part of China's national security strategy and finished at the end of 2009. The number of surveillance sentry posts reportedly number in te thousands, and fiber optic cables were used to connect these posts to 10 control centers. According to the same report, all border patrol stations with more than 100 soldiers have been linked up to this surveillance system (Xinhua News Agency, February 2). A member of the Committee cited by the official Xinhua News Agency stated that the completion of these installations reflect the development of China's border and coastal defense from a scattered, single-mission-oriented, incompatible system to a diversified, well-connected, comprehensive system, which serves military, political, economic and social benefits (Xinhua News Agency, February 1). Furthermore, the digitization of Chinese border surveillance systems can assist the Chinese military in combating the so-called "Three Evils," which Beijing has identified as "terrorism, separatism and religious extremism." The system will also reportedly help stem human smuggling, illegal immigration, drugs and other unlawful activities (Xinhua News Agency, February 2). In his remarks at the opening ceremony for the Committee meeting, Defense Minister General Liang Guanglie stated that with the completion of the system the work of border and coastal defense "must be enhanced for national interests." Defense Minister Liang emphasized that, "Defending China's Sovereignty, territorial security and maritime interests should be a top mission of the country's border and coastal defense work" (Xinhua News Agency, January 29; Global Times, January 29). In the final analysis, the completion of this massive infrastructure network clearly strengthens China's ability to enforce its border and coastal defense through hardening control of key places and increasing mobility along border and coastal areas. The modernization of China's defense infrastructure can be both a source of stability for China and neighboring countries as well as pose unique challenges to those with whom China has territorial disputes. My views on the Tibetan Envoys' recent trip to Beijing appeared in The Pioneer. The article is titled Beijing talks fail, but hope flickers. Click here. My article on Bonjour India Festival is posted on Sify.com website. Enjoy the Giraffes. A few years ago, when I wrote an article about the 10 things I hate about India, I was criticised by many, while others agreed. As I grow older, many more things irritate me now. I have listed 10 of them below. However, having completed 35 years in this country, I realise how much I love this incredible India, the following irritants notwithstanding: Click here to read the article. Veni, Vidi, Vinci is the famous Latin sentence pronounced by Julius Caesar in 47 BC after a short war against Pharnaces II of Pontus. “I came, I saw, I conquered” cannot be used for the recent visit of Lodi Gyari, the Dalai Lama’s Special Envoy and his colleagues to Beijing. They went, the saw their Chinese counterparts, but did not conquer anything. But, this is not new. It has been happening since the early 1980’s when the Tibetan leader sent his first representatives to Beijing to discuss with Deng Xiaoping’s officials. The first serious talks between Dharamsala and Beijing held in 1982, yielded nil results (Gyari who was already present as a junior official, knows it). Interestingly, the main topic of discussion continues to be the same, the fate or role of the Dalai Lama. 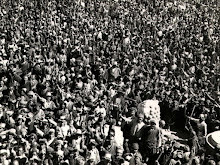 Already in the 1980’s, the Tibetans had clarified that the Tibetan leader was only interested by the fate of 6 million Tibetans living on the high plateau and not by his status. As for the exiled Tibetan officials, they should not worry about their jobs and living conditions, “It will only be better than before”, they were told. Unfortunately, talks never went further and even a visit of the Tibetan leader to his native land in 1985 was not permitted by the Chinese authorities. Nearly 30 years later, where are we at? The Tibetans delegates have come 9 times to China since 2002, they saw representatives of the United Front Work Department of the Chinese Communist Party’s Central Committee, but they have not conquered an inch (my book on the subject is fittingly titled “the negotiations that never were”). Today, China has become a superpower, the second economy (and first exporter) of the planet; Beijing has brilliantly hosted the Olympic Games and has not only survived the world economic downfall, but it is considered the most important key to an eventual recovery of the planet’s economy. Despite these tremendous changes in the Middle Kingdom’s status, the Dalai Lama remains at the center of the preoccupations of Beijing’s leadership. Their stance has even hardened; the Party bosses don’t even want to hear about the Tibetan leader whom they call a splittist. Gyari’s interlocutor, Zhu Weiqun, who is Executive Vice-Minister of the United Front Work Department affirmed that the Dalai Lama is not representing the Tibetan people. During a Press conference held after Gyari’s visit, he said that under the Party leadership, the Chinese government and the government of Tibet Autonomous Region were the only representatives of the Tibetan people. On his return to India, Gyari publicly objected to this: "It cannot be disputed that His Holiness legitimately represents the Tibetan people, and he is certainly viewed as their true representative and spokesperson by them.” He added: “His Holiness the Dalai Lama speaks on behalf of the Tibetan people, with whom he has a deep and historical relationship and one based on full trust. The Tibetan Envoy made this point clear during his meeting with Zhu. He said that he told “the Chinese side to stop these baseless accusations against His Holiness and labelling him a separatist." As long as the Chinese authorities are not ready to recognize that the Dalai Lama has a role to play in the future of Tibet, the ‘talks’ will continue to be fruitless. During his press conference, Zhu affirmed: “The private representatives have no legal status to discuss with us the affairs about Tibet Autonomous Region. They are only the Dalai Lama's private representatives, so they can only talk about the prospect of the Dalai Lama, at most, the prospects of a small party around him." Where do we go from here? Probably no where! A noticeable change however is that Beijing admitted having met the Dalai Lama’s Envoys. In the past, when asked the spokesperson of the Chinese Ministry of Foreign Affairs would just state that some ‘overseas compatriots’ had visited Beijing. Now not only a communiqué was issued a day later, stating that “Communist Party of China (CPC) officials have met with private envoys of the Dalai Lama in Beijing,” but Zhu and two Tibetans officials who met Gyari and his team gave a press conference attended by Chinese and foreign correspondents. In the past, the Tibetans were asked to keep these contacts secret. The Chinese officials reiterated that no concessions would be made on the issue of China's national sovereignty. It remains though a vague statement as the Dalai Lama is not asking for a solution disputing the ‘national sovereignty’ of China. 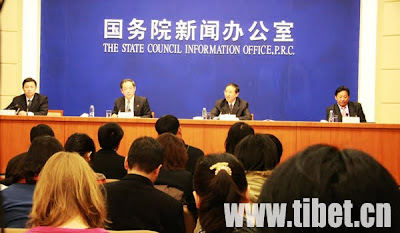 During the press conference, Zhu made it clear that Beijing did not recognize the “the so-called 'Tibet government-in-exile composed of those who defected to India” as it “absolutely violates China's laws”. Without giving any explanation, Beijing rejected the Memorandum for All Tibetans to Enjoy Genuine Autonomy presented in November 2008 by Gyari. The Memorandum was based on the Chinese Constitution and the Dalai Lama’s representative had proposed a formula respecting the Constitution and the Chinese laws. The point is that today the People’s Republic of China does not implement its own laws and the Constitution is a mere piece of paper at the service of the Communist Party. At the end, Zhu suggested that the Dalai Lama should correct his mistakes, without naming the ‘mistakes’. Many young Tibetans are not unhappy about the standstill in the ‘talks’. The day the Envoys arrived in Beijing, Xinhua published an article which will make you understand why. The article said: “Tibet is expected to have 100,000 Internet users this year, a 15 percent rise from 2009, according to the Tibet Autonomous Regional Communications Administration”. The news item is accompanied by a photo showing two beautifully dressed young women Tibetan using a 3G mobile phone in Tingri county, north of the Nepal border, not far from Mount Everest. The Chinese often boast of the development that they brought on the Roof of the World, but nobody is fooled (especially after the announced withdrawal of Google from China). Everyone knows that any search containing words like ‘Tibet’, ‘Dalai Lama’ or Tiananmen’ is today blocked by the Great Firewall of China which domestically filters Internet. Why should young Tibetans who enjoy a great freedom in India and elsewhere in the world, suddenly decide to return to a Tibet under military occupation and constant censure. Step for a minute in a young exiled Tibetan’s shoes. Today they have a leader practicing non-violence, speaking of universal responsibility and preaching the highest human values, would they like to be guided by a bench of politburo members? Why should young Tibetans choose to follow these ‘vituperating’ leaders as an American analyst called them? The latest vituperation: during his press conference, Zhu Weiqun said that a meeting between Obama and the Dalai Lama would "violate international rules". He threatened that China will take ‘necessary measures’ to counter it. Bill Burton, the White House Deputy Press Secretary rightly replied: “The [US] President told China's leaders during his trip last year that he would meet with the Dalai Lama, and he intends to do so." The Tibetan delegates may have not conquered, but clearly the mighty Chinese Communist Party has lost one more chance to deal decently with the non-violent Tibetan tribe. What Hu Yaobang told Gyalo Thondup in 1981 keeps coming to my mind: he said that the Dalai Lama should “contribute to upholding China's unity and promoting solidarity between the Han and Tibetan nationalities”; if the Chinese are sincere, they should see that it is their best bet as he is the only person who possess today the wisdom to bridge the insuperable gap existing today between the Tibetans and the Hans. Beijing should take advantage of this; the leadership should stop insulting the Dalai Lama and behave like responsible people. If China wants to conquer, the Dalai Lama is the key. Will they be wise enough to recognize this?